Pressure washing is great before staining a deck as it is the way to prepare your deck for wood stain, more effectively. If you have a deck on your house then you already know how hard it is to maintain a deck. Having said that, there is enough stress when you start scrubbing the deck. A nightmare! But, I got you covered and going to describe how to pressure wash a deck before staining in 6 easy steps. Pressure washer executes the troublesome work easily. 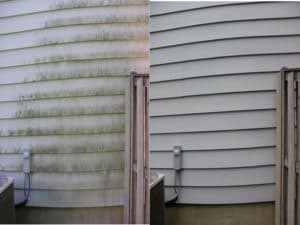 A Pressure washer can do more cleaning than a chemical based deck brightener ever. But if you fail to use this washer properly then it will do harm to your deck. It has both the capacity to carve and gentle washing. By using it to the higher pressure or set the nozzle close enough to the wood then it will etch the wood and damage permanently and you cannot recover with staining it. It is not compulsory to pressure wash your deck before staining, but it will help to keep the stain last long. A proper deck cleaner or brightener can assist you to remove the gray fibers, dirt, leaves and other wastes properly. I will help you to choose the perfect pressure washer and the best way to wash your deck before staining. 1 What is Staining a Deck? 6 Before I Let You Go! What is Staining a Deck? Staining is a process of adding color on woodworking projects that changes its natural appearances. Your deck can be injured by direct sunlight, rainwater, environmental wastes, fungus attack etc. Staining a deck will enhance the beauty of deck on your house and protect it from damage and thus extending the life of your deck. Three primary ingredients: pigment, solvent, and binder are consisting of a commercial wood stain. These components work as for whether the stain is oil or water based, a variety of wood color, darkening of wood and highlight the grain pattern and woodworker’s skills. The basic difference between painting and staining is that painting covers the surface of the wood and hides it and requires extensive scraping to remove, while staining is easier to apply and used to protect and beautify the deck. It doesn’t matter whether your deck is brand-new or fully fresh or older and damaged you have to clean your deck before staining on it. 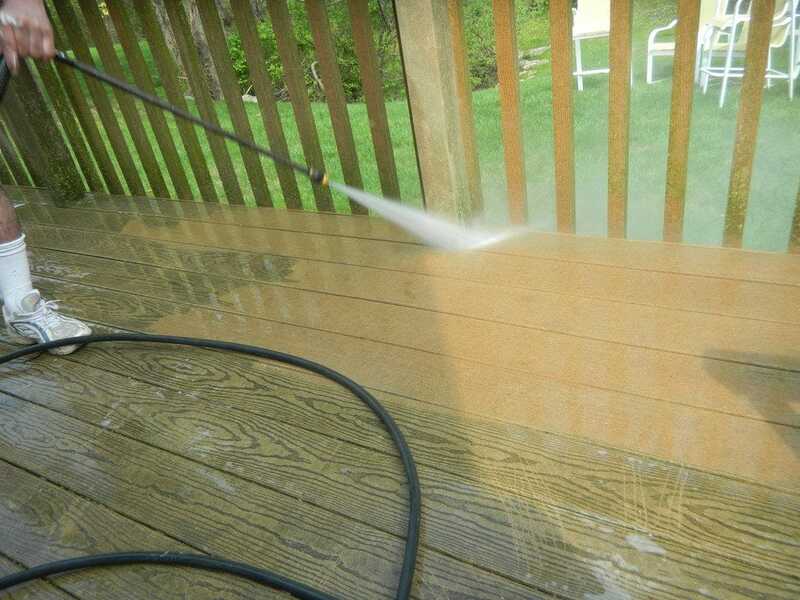 Cleaning helps stain to lasting a long time and reduces the amount of deck maintenance as well. All new or old woody materials must be cleaned before staining to remove its threads that can prevent stains to penetrate the pores of the wood. Older decks should be cleaned cordially as they accumulate dirt by fungi, algae, dust from the air and other sources. If you use a finish before and it’s already ruined, then you have to remove it because new finish may not last long. It saves our valuable time. By manual washing critical parts requires more time but pressure washer don’t. Pressure washing improves curb appeal if you think you will sell your house soon. The operating system is easy and human-friendly. Easily clean the tough grim, dirt, grease from any kinds of outwards or external appearance. Requires less water and solvents than manual washing, so it is an environment-friendly process. Takes very little space to store it after washing. Protects your home from harmful fungi, algae, bacteria etc. Regular pressure washing arrangement keeps your family delightful and sound health. This is one important part to consider. 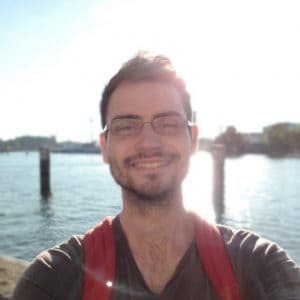 Cost is all you need to consider in a project in the starting. Cost depends on its size, condition, type. 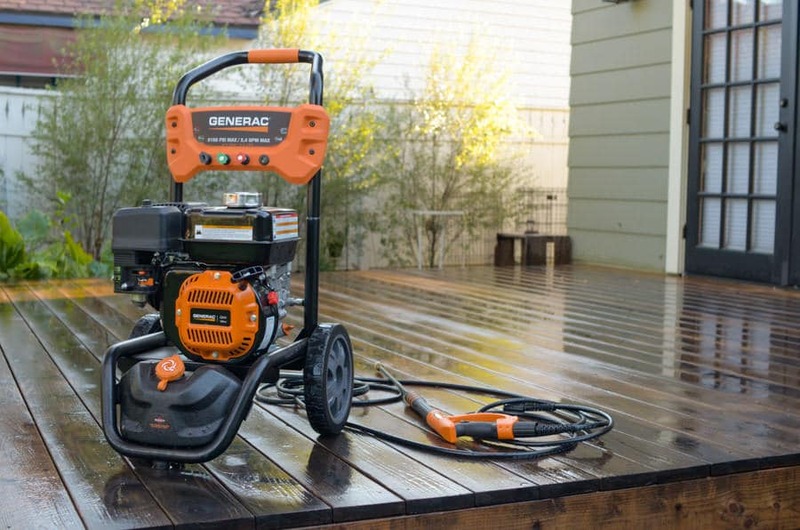 Average cost to power wash deck as estimated on each square feet varies from $0.25 – $0.45 USD. But cost depends on buying a pressure washer or hiring one temporarily on a daily or hourly basis. You can clean a deck about 500 sq.ft. to pressure washing, it will require 1-1.30 hour. This will cost between $50 to $65 a day. Required water for a regular pressure washer per minute is 10-12 gallons. Don’t worry about that. You can buy 1000 gallons of water at only $1.50. A sealant will be required after removing mold and mildew and protect future damage on wooden deck. It will cost about $17-$50 per 5 gallons for 300 sq.ft. As you can see it does cost a bit (depends on your capability). But the majority of the cost lies in staining a deck after pressure washing. You bought a pressure washer from a market and start cleaning with it. That’s all? If you do so then you will notice that your nice flat wooden board will turn into a shape that looks like a seashell and do permanent harm on it that cannot be repaired with anything. A pressure washer is a medium to get injured easily if you are not conscious. So the proper use of it will reduce your time, money, and health. Now you guys may be worried about how to pressure wash your deck, right? Don’t panic. Pressure washing is not a difficult task at all. Let me tell about the best possible ways to wash a deck step by step without doing any harm. 1. Safety Measures are the first step to get rid of serious injuries. Wear a goggle that saves your eye. Closed-toe shoes for betterment. Keep yourself safe from the direct spray. As it used at highest force so don’t point the nozzle at any person or pet. Short pant, loose clothing, and jewelry should be avoided. After a long time use the engine of the pressure washer gets very hot, so be careful to move it. Keep the washer distant from children when it is in use. 2. The Site Should be Prepared, remove all loose debris that is adjacent to the deck. To prevent tripping and tangling hoes you have to remove all related obstacles. Cover all nearby components which have the possibility to hurt. Fix those irritating stuff that disturbs the comfort cleaning. Wind direction is another obstacle, so pay attention to this. 3. A Cleaner Has to be Applied Wisely. Firstly, follow the manufacturer’s instructions to set up. Check out the washer’s manual option to fix a proper spray pattern for your wooden deck. Now use low-pressure soap-dispensing nozzle and add the solution in the required manner. Then power up the machine and spray solution from top to bottom of the deck. 4. Use a Utility Brush and Rotating Scrub Brush, for typical places and tight corner, use a utility brush to bleach the solution. Utility brush should be synthetic in form and a long-handled. Long handle will help to reach all stubborn dirty place. And a rotating scrub brush is used to remove heavy spots and dirt. 5. Start Rinsing With the Conventional Widest Nozzle, move with the perfect angle with the trigger. A 40 degree to 60-degree tip size is the standard degree of angle from where the water emerges. You have to concern about the pressure you supplied. If you wash with high pressure it will etch the wood surface. The damage is permanent and you cannot overcome it. Use 500-600 psi(pounds per square inch) for softwood, and 1200 psi or less than that for harder wood. Maintain the trigger 6feet away from the deck surface. 6. After Successfully Cleaning the Deck power off the Machine and chose an appropriate and your desired wood stain for further beautify it. Your deck is probably your favorite place to pass leisure time and to recreation purpose. It’s a neat and clean environment may refresh your mind. To maintain it, regular washing is necessary. When you clean it and unconditionally you get injured, then it will useless. So be careful using the pressure washer. After buying one read through the indicators supplied by the manufacturer because each machine is different. Always wear safety goggles to protect your eyes from the chemical. Enclosed running shoes, musk, long pants have to wear for protection. Don’t use a gas pressure washer in confined areas it has the possibility to take carbon monoxide by breath excreted from combustion engines. Kids not allowed when cleaning operation is running. If you want to hire a professional cleaner, make sure whether they are well trained or not. Restaining a deck is great. Washing the deck is not exactly so easy with manual, but using pressure washer is definitely worth the time, money and effort. In this article, I have tried my best with my personal experience to give you basic information on how to pressure wash a deck before staining. I hope if you follow my instructions, there will be no need to waste your valuable time and money. And if you wash the deck yourself rather than a professional deck cleaner, then you have to be careful using it. This was just a brief guide, and I hope you guys enjoyed reading it.